AIM fought to win funding for quality after school programs in the highest poverty schools in Montgomery County. The Montgomery County Public School system (MCPS) and Montgomery County Recreation Department, worked with AIM to create the Dream Academy (formerly known as Child First), an innovative after-school and parent-organizing program that over time will help organize and serve thousands of families in our rapidly changing-county, where 55,000 MCPS students receive subsidized meals and the school system population is now nearly 70% students of color. Providing affordable high quality after-school enrichment programs and engaging parents in the life of the school is one of the best ways to support children and families at struggling schools. The program served 240 students in 2016-2017, and will serve 480 in 2017-2018. We are working to expand the program more in the future. This was a year of big victories for AIM–$67 Million for Affordable Housing, expanding Excel Beyond the Bell Elementary to 720 students in seven schools, the opening of the final community center in Historic African-American neighborhoods, and real action from Smith and Wesson on Gun Violence. Click below to learn more! AIM worked with Chief Manger, President of the Major Cities Chiefs Police Association, to support our national efforts in getting Smith and Wesson shareholders to vote for significant measures to improve safety and accountability for their firearms products. Click here to find out how AIM and the Industrial Areas Foundation won with Smith and Wesson and Sturm Ruger. 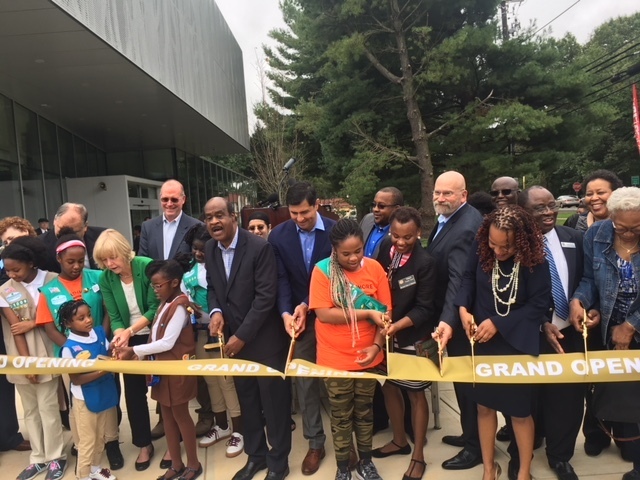 The ribbon cutting to open the new Good Hope Neighborhood Recreation Center took place on Oct. 6 in the Good Hope neighborhood of Silver Spring, Md. Local officials, residents and community members all gathered to witness the opening of the last of the four centers located in historic African-American neighborhoods to undergo renovations in Montgomery County. Good Hope along with Ross Boddy, Scotland and Plum Gar recreation centers were overlooked and neglected for many years and dating back to the 1990s, neighborhood leaders weren’t even able to get basic repairs done in the community centers. Centers were dealing with issues such as flooding and broken windows, according to social advocacy group, Action In Montgomery (AIM). Click “READ MORE” to see the video of the action. SILVER SPRING, Md. – Nearly two years after the August 10, 2016 blast that killed seven people at the Flower Branch Apartments in Silver Spring, survivors are demanding better support from the Montgomery County government. Through advocacy organization Action in Montgomery (AIM), the group of survivors met to address their concerns Tuesday night at JoAnn Leleck at Broad Acres Elementary School. Survivors told their stories about how they lost their possessions along with how they were physically and mentally scarred by the natural gas explosion. They said since the accident, they have been forced to pay higher rents, haven’t received adequate mental health treatment related to the trauma and that their opinions were left out of the 2016 county report that detailed the response to the tragedy. Gustavo Zuniga spoke to the crowd, recounting how the roof fell inside his apartment, knocking him unconscious. He said the only reason that he is alive is because his wife was able to pull him from the rubble.